Prospective renter Michelle Golon (right) looks through a one bedroom apartment with Wendy Hall inside Hall's duplex on Thursday, April 5, 2018 in Bull Valley. A shortage of apartment rentals in McHenry County has some renters struggling to find living spaces. Prospective renter Michelle Golon (left) looks over the application process with Wendy Hall after seeing a one bedroom apartment inside Hall's duplex on Thursday, April 5, 2018 in Bull Valley. A shortage of apartment rentals in McHenry County has some renters struggling to find living spaces. 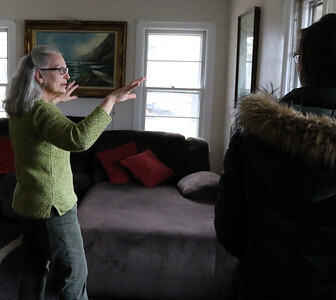 Wendy Hall shows the basement for a one bedroom apartment inside her duplex to prospective renter Michelle Golon on Thursday, April 5, 2018 in Bull Valley. A shortage of apartment rentals in McHenry County has some renters struggling to find living spaces. 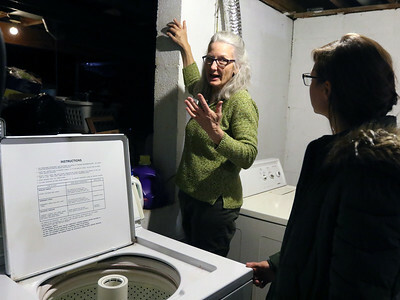 Wendy Hall (left) shows the backyard from a one bedroom apartment inside her duplex to prospective renter Michelle Golon on Thursday, April 5, 2018 in Bull Valley. A shortage of apartment rentals in McHenry County has some renters struggling to find living spaces. 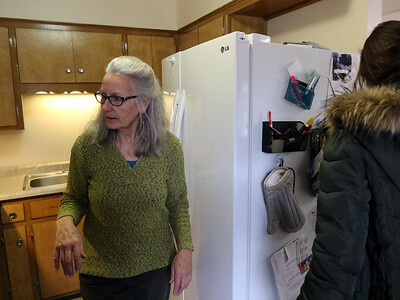 Wendy Hall (left) shows the kitchen for a one bedroom apartment inside her duplex to prospective renter Michelle Golon on Thursday, April 5, 2018 in Bull Valley. A shortage of apartment rentals in McHenry County has some renters struggling to find living spaces. Prospective renter Michelle Golon (left) shakes hands with Wendy Hall after taking an application for a one bedroom rental apartment inside Hall's duplex on Thursday, April 5, 2018 in Bull Valley. A shortage of apartment rentals in McHenry County has some renters struggling to find living spaces. Wendy Hall shows a one bedroom apartment inside her duplex to prospective renter Michelle Golon on Thursday, April 5, 2018 in Bull Valley. A shortage of apartment rentals in McHenry County has some renters struggling to find living spaces.